Her Royal Highness Princess Beatrice of York will be honored at the 17th Annual New York Gala on Wednesday, May 15, in Manhattan. Tickets and tables may be purchased here. The hospital is seeking candidates for the positions of Executive Directorand Nurse Educator. These are full-time paid positions. Information can be seen on our website here. LFHC is seeking a Neonatal Nurse to volunteer at the hospital in Luang Prabang for a period of 6-12 months. The volunteer is primarily responsible for the education, training and development of the LFHC neonatal nursing team. Information about the position and how to apply can be found here. When LFHC first opened its doors in 2015, one of its first patients was a 7-year-old boy named Bounsaweng Bouadichith, who was diagnosed with thalassemia when he was an infant. He arrived weak and pale and LFHC doctors promptly started treating him. During the past four years, he has had frequent medical appointments and is one of the Thalassemia Clinic patients who received blood transfusions once or twice a month. Bounsaweng was also diagnosed with an enlarged spleen. One of the functions of the spleen is to filter old or damaged red blood cells. Thalassemia destroys a large number of red blood cells and as they are filtered by the spleen, it becomes enlarged and has to work harder. After extensive planning by a multidisciplinary team, Bounsaweng was wheeled into the Operating Theater on Feb. 20 and underwent the first elective splenectomy for a thalassemia patient at LFHC. An Interplast Team recently visited LFHC and provided free reconstructive surgeries to children and adults with such disabling conditions as burns or severe scars to the hands, fingers, toes and small joints. The team, supported by Australian Aid, worked closely with the LFHC Operating Theater and performed 15 surgeries. The Interplast team also served as mentors and trainers for LFHC staff in the management of complex wound care. The hospital is looking forward to their future visit as there are many more children who will benefit from their advanced reconstructive surgical care. Interplast is an NGO that sends volunteer surgical teams and health care professionals to 17 countries across the Asia Pacific region. A group of LFHC staff members recently gained insights into protecting patients and themselves from various types of infection. 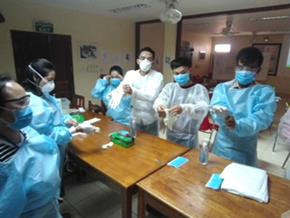 The training session included information about the use of sterile gloves and masks, the proper disposal of infectious material and how to treat an accidental needle puncture. The staff also learned how to identify patients who are more susceptible to infection and how to use isolation rooms. As a teaching hospital, LFHC is constantly offering its staff classroom instruction and hands-on training. GuideStar, the world’s largest source of information about nonprofit organizations, has awarded its 2019 Platinum Seal of Transparency to Friends Without A Border. Friends received the Platinum Seal last year, as well. It is the highest rating awarded by GuideStar. Two stars of stage and screen will be lending their talents to the 17th Annual New York Gala. Tony nominee and Emmy winner Liz Callaway is the featured musical performer and London-born television star Sean Maguire will serve as the event’s emcee. Liz made her Broadway debut in Stephen Sondheim’s Merrily We Roll Along. She has gone on to star in Baby, Miss Saigon, The Look of Love, The Three Musketeers, and for five years appeared as Grizabella in Cats. Liz has six solo recordings, including her newest album, The Essential Liz Callaway. After extensive planning by a multidisciplinary team, Bounsaweng was wheeled into the Operating Theater on Feb. 20 and underwent the first elective splenectomy for a thalassemia patient at LFHC. Volunteer Dr. Mark Saxton and Lao surgeon Dr. Kuaneng Lao performed the procedure, along with LFHC’s Operating Theater team. The Thalassemia Clinic team of doctors and nurses prepared Bounsaweng and his family during the months leading up to the surgery. Child Life therapist Kongmeng Sialee helped the family understand the procedure’s risks and benefits. The Laboratory team was also essential in preparing the Luang Prabang Provincial Blood Bank to ensure that a large supply of cross-matched blood would be available for transfusions during and after surgery. Splenectomy for Thalassemia patients increases life expectancy and decreases blood transfusion requirements, but comes at a high risk for surgical complications and infections after surgery. Bounsaweng remained at LFHC for nearly a month after his surgery. His recovery was complicated by inflammation in his lung due to pancreatic juices leaking out during surgery, but he eventually responded well and was able to return home feeling much better. He and his family have come for follow-up appointments in the Thalassemia Clinic and he has not required a transfusion since his splenectomy. His family reports he has much more energy and is able to go back to school and thrive as a happy young man. The LFHC team is very happy to see how much progress he has made. Guidestar, the world’s largest source of information about nonprofits, has awarded its 2019 Platinum Seal of Transparency to Friends Without A Border. Platinum is the highest level of recognition offered by GuideStar. The Platinum Seal means that Friends Without A Border has demonstrated that it is focused on measuring progress and results. It also means that millions of people will be able to see information about Friends Without A Border on the GuideStar website and its network of more than 230 websites and applications. GuideStar states that its website receives 9 million visitors each year. Burns dressings Particularly useful are: paraffin gauze dressings like jellonet or bactigras, acticoat, or grassolind. Ondansetron oral dissolving tablets – 4 mg. Accessories for girls age +4 Polly Pocket, Sylvania dolls, etc. Bubbles Small bottles are better (party pack size). For less weight, buy a party pack, empty out the liquid and bring us the wands and small containers, please. Construction toys Small sets of magnetic building blocks are great. The hospital is seeking candidates for the positions of Executive Director,Medical Director and Nurse Educator. These are full-time paid positions. Information can be seen onour website here. 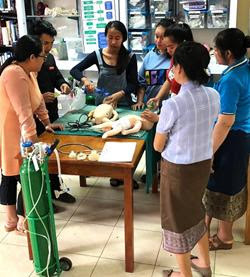 LFHC doctors and nurses have conducted two neonatal resuscitation training sessions for staff members at LHFC and Luang Prabang Provincial Hospital. The training involves lectures and simulations focusing on the care of an infant immediately after birth. The training is planned for once every month during the next three months by different LFHC nurses and doctors to ensure all of the staff are trained in neonatal resuscitation. The training is also an opportunity for LFHC staff to collaborate with their Provincial Hospital colleagues who also see many neonates. 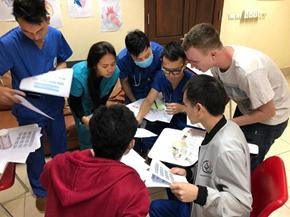 The sessions have been led by doctors Lakiher Latongxai and Annkham Thammaseng, nurses Somchit Bounnaphone and Somphone Lao and expat nurse volunteer Sam Hardeman. A multidisciplinary team at LFHC recently saved the life of a 2-year-old boy who was suffering from an “acute abdomen,” a medical emergency often associated with ruptured intestines or a perforated appendix. The boy, Khamphan Nun, was feverish and dehydrated by diarrhea. After much questioning by staff, his family revealed that their son had been bitten by a dog in the scrotum and that he had an unrepaired inguinal hernia. 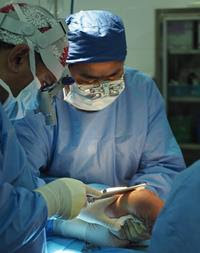 Khamphan was rushed into the Operating Theater, where a surgical team repaired a part of his intestine that had herniated into his scrotum, which had been bitten by the dog. The surgeon had to perform an ostomy. Read more about Khamphan’s case on our website here. Monthly blood drives are a vital component of operations at Lao Friends Hospital for Children, which has seen an increase in surgeries and thalassemia patients. Twenty-one people were donors during the February blood drive at the Friends Gallery in downtown Luang Prabang. 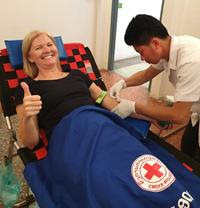 There always seems to be a shortage of blood in the province and LFHC encourages local residents, expats and tourists to donate.Read more here. The LFHC staff is ever-vigilant for signs of malnutrition in the children they see. Last year, more than 150 children were treated for severe or moderate malnutrition and hospital administrators started a follow-up clinic that includes test-feeding (under medical supervision) of ready-to-use therapeutic food (RUTF). Nearly three tons of RUFT have been imported to ensure an adequate supply of this vital medication for the malnourished children in the region. The hospital’s therapeutic food program is designed to dramatically reduce the need to hospitalize malnourished children for long periods. Globally, about 45 percent of the deaths among children under the age of five are linked to poor nutrition, according to a UNICEF article published in October.Read more here. Among the many training activities that regularly occur at LFHC was a recent session about wound care. Jack O’Meara, an ex-pat volunteer, taught a group of Lao doctors and nurses how to evaluate wounds and apply the appropriate dressing. As a teaching hospital, LFHC trains dozens of doctors, nurses and other health care professionals every year. Last year, 44 medical volunteers and 60 nurses contributed to the training and mentoring of the LFHC staff. Copyright © 2017 Friends Without A Border, All rights reserved. Friends Gallery in downtown Lunag Prabang. encourages local residents, expats and tourists to donate. blood transfusions to children afflicted with the thalassemia blood disorder. as many as 12 units of blood per day. Thalassemia is an inherited blood disorder that can cause anemia. Last year, more than 150 children were treated for severe or moderate malnutrition. Hospital administrators have started a follow-up clinic that includes test-feeding (under medical supervision) of ready-to-use therapeutic food (RUTF). The hospital’s therapeutic food program is designed to dramatically reduce the need to hospitalize malnourished children for long periods (Read more here). be a serious problem in many rural regions of Laos. In March 2018, the World Bank reported that Laos has reduced poverty and hunger and improved education and health outcomes in recent years. However, the nation lags in the area of child nutrition, the World Bank stated, noting that stunted growth impacts 44 percent of children under the age of five. A recent report by the nongovernmental organization Save the Children cited the same percentage of stunted growth children. Lao officials issued a report in June asserting that the rate of stunting from malnutrition among children under the age of five had dropped to 33 percent in 2017 from 44 percent in 2011. 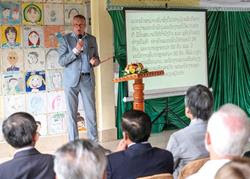 The officials stressed that malnutrition remains a concern in several provinces, including Luang Prabang Province, according to a report published by Radio Free Asia in July. Khamphan was rushed into the Operating Theater, where a surgical team repaired a part of his intestine that had herniated into his scrotum and was then bit by the dog. The surgeon had to perform an ostomy. The medical and nursing team then began the task of teaching Khamphan’s family about ostomy care. Child Life Therapist Kongmeng Sialee has been instrumental in helping the boy and his family cope with this major change in his life. The nonprofit organization Friends of Ostomates Worldwide has donated large amounts of ostomy supplies for Khamphan. 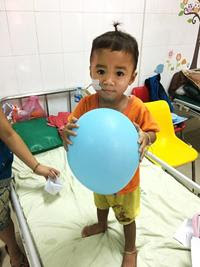 A serious complication impairing Khamphan’s health was his severe weight loss and dehydration caused by a bowel perforation. What made this even worse was that he suffered diarrhea whenever attempts were made to renourish him, as he had lost most of his capacity to absorb complex carbohydrates, fats, and proteins. With special attention from the LFHC nutrition team, which included a complex plan using special formulas with pre-digested nutrients, Khamphan made a slow transition back to a regular diet. After a little more than a month in LFHC, Khamphan was able to go home with his family. He returns every month to allow doctors to evaluate his ostomy and nutrition progress. Her Royal Highness Princess Beatrice of York will be honored at the 17th Annual New York Gala on Wednesday, May 15, in Manhattan. Information about the fundraising event and how to purchase tickets and tables will be forthcoming. The hospital is seeking a Medical Director and a Nurse Educator.These are paid positions. Information can be seen on our website here. LFHC has a pressing need for nursesand physicians. The hospital is seeking pediatric, neonatal and operating room nurses. If you know someone who might be interested in volunteering, please refer them to our website for more information. Friends and supporters of Lao Friends Hospital for Children joined the staff and members of the Board of Directors of Friends Without A Border on January 22 to celebrate the 4th anniversary of the facility. LFHC doctors and nurses have seen 79,107 children during the first four years of operation. Photos of the event may be seen here on our website. Just How Busy was LFHC in 2018? Extremely busy. 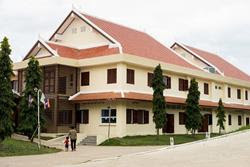 Outpatient and emergency caseloads increased dramatically in 2018 as a result of the cessation of pediatric services at Luang Prabang Provincial Hospital and the growing reputation of LFHC. Check out a brief video about LFHC “by the numbers” in 2018 here on our website! 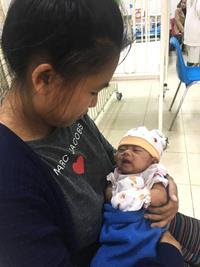 A 6-week-old baby named Young Noy was brought to LFHC in December with what appeared to be severe malnutrition. The hospital’s medical and nutrition teams determined that the infant was suffering from kwashiokor, an dangerous form of malnutrition associated with fluid retention. Kwashiorkor is caused by a lack of protein and is most often seen in regions experiencing famine. After taking a careful history with Young Noy’s mother, the staff learned that the infant was born at home and had received only condensed milk since birth. His mother felt unable to breastfeed him. The staff immediately began to feed baby formula to Young via a nasogastric tube. He was also given thiamin and zinc and treated with antibiotics for a skin infection. Meanwhile, his mother was taught about the importance of breastfeeding and trained in the proper breastfeeding process. Young gradually began to breastfeed and gain weight. After 23 days at LFHC, he and his thankful mother left the hospital. 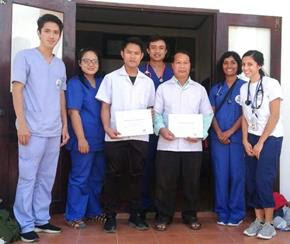 Late last month, Lao staff members at LFHC trained a doctor and nurse from Nambak District Hospital in the care and treatment of thalassemia patients. The goal of the training is to give thalassemia patients a place to receive treatment closer to their homes. 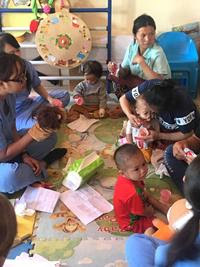 Some families travel long distances every month to bring their children to LFHC, which has the only pediatric thalassemia clinic in northern Laos. These families are spending a large proportion of their income on transportation. Nambak is about 75 miles north of Luang Prabang. Thalassemia is an inherited blood disorder that causes anemia and can be fatal. Many patients need monthly blood transfusions. Despite the high prevalence of thalassemia in Laos, there are only two pediatric thalassemia clinics in the country – at LFHC and in the capital city of Vientiane. 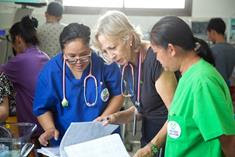 The Royal Australasian College of Physicians has awarded its International Medal for 2019 to Dr. Christine Sanderson, the former Medical Education Director at Lao Friends Hospital for Children. The honor is bestowed upon physicians who have provided outstanding service in developing countries. Dr. Sanderson has served three years as the hospital’s director of medical education. Her three-year contract with LFHC ended in January. The RACP award honors physicians who have made a significant contribution to clinical service and a demonstrated commitment to mentoring and training future and current physicians. Her Royal Highness Princess Beatrice of York will be honored with the Friends of Friends Award during the 17th Annual New York Gala on May 15 in Manhattan. In October, the princess attended the Second Annual Luang Prabang Gala, ran in the 2018 Run for the Children Luang Prabang Half Marathon fundraiser and toured the newly expanded Neonatal Unit. Details about the 17th Annual New York Gala will be forthcoming. About 750 people, including Cambodian government officials, international guests and hospital staff, attended the 20th Anniversary Celebration of Angkor Hospital for Children on January 25 in Siem Reap. AHC was the first hospital built and operated by Friends Without A Border. In 2013, AHC became an independent, self-managed hospital. 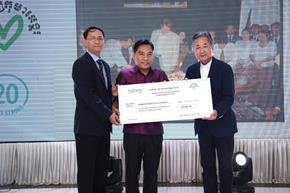 Friends Without A Border Founder Kenro Izu presented a check for $27,601 to Dr. Ngoun Chanpheaktra, Medical Director of Angkor Hospital for Children, and Navy Tep, the facility’s Chief Operating Officer, during the event. The donation was raised at last year’s Friends of Friends New York fundraising event in Manhattan. The January newsletter incorrectly attributed certain developments at LFHC to administrators who recently left their positions at the hospital. The report should have stated that several developments, such as the opening of the Surgery Department, Thalassemia Clinic and Neonatal Unit, occurred during the tenure of LFHC Executive Director Dr. Simon Young. Other staff members, however, designed and implemented plans to open these departments. The report also incorrectly identified the creator of the anatomy, physiology and pathophysiology curricula for nurses. Sarah Cutting, who recently left her position as nurse educator, created and implemented those courses. We apologize for the errors. In training the Nambak staff, LFHC administrators envision them spreading this clinical knowledge to other hospitals and health care professionals across Laos. The first doctor and nurse from Nambak arrived on Jan. 29 training. They had a half day of theory, followed by two days of practical training and observation in the LFHC Thalassemia Clinic. Two more Nambak doctors and nurses will be trained over the next few months and their hospital will soon start to receive patients. The patients will be treated at Nambak for two months and then return to LFHC for the third month. LFHC administrators hope this will be the start of a great collaboration between LFHC and Nambak District Hospital.